Marlborough is located at the top of New Zealand's South Island. With the inter-island ferry running from Wellington to Picton several times daily, this region is popular with Kiwi's from both the North and South Islands and of course our international holiday seekers. The Marlborough Sounds are a maze of sheltered waterways and secluded bays, and pristine native bush. A popular region for those interested leisure activities on the water - such as sailing, fishing, water-skiing and kayaking. The spectacular Queen Charlotte Track, which stretches from historic Ship Cove to Anakiwa, combines unforgettable native bush and coastal scenery. 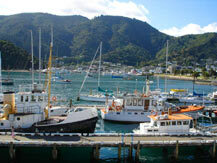 The picturesque seaport township of Picton is not only a gateway to the Sounds but also a charming destination. 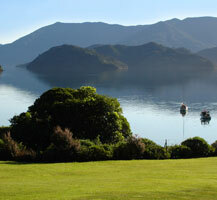 The scenic Queen Charlotte Drive links Picton and the seaside village of Havelock. The winding bush-fringed road is truly delightful, with literally hundreds of great spots to stop along the way for picnics. Havelock is at the head of the Pelorus Sound and the once thriving gold-mining town is now New Zealand's primary producer of greenshell mussels. Take a trip inland from Picton and you will find the largest town in the Marlborough region, Blenheim. The real lure for many to Blenheim is undoubtedly the wineries. The Marlborough region is New Zealand’s largest producer of wine and is particularly famous for it sauvignon blanc. Stephen's Island, the most northern island of the South Island, is a Tuatara sanctuary, the world's only living relative of the dinosaur. The links below will help you guide your search through all the information on KiwiWise regarding one of New Zealand's most beautiful and tranquil regions, Marlborough.